Apple is a multinational technology company which was founded in 1976 by Steve Jobs and partners. According to Forbes, Apple is now estimated to be valued at a whopping $745 billion dollars! By taking a look at their marketing strategies it is pretty obvious why. Marketing is the act of selling, without selling. An excellent marketing campaign will bring to the attention of potential buyers - a great new product - that meets their needs. Where there is a demand for a product - there is room for a strategic marketing campaign. Identifying the best possible way of delivering your message to your target buyers is the key to success. We think Apple has hit the nail on the head more than a few times and to be the best, you have to learn from the best. 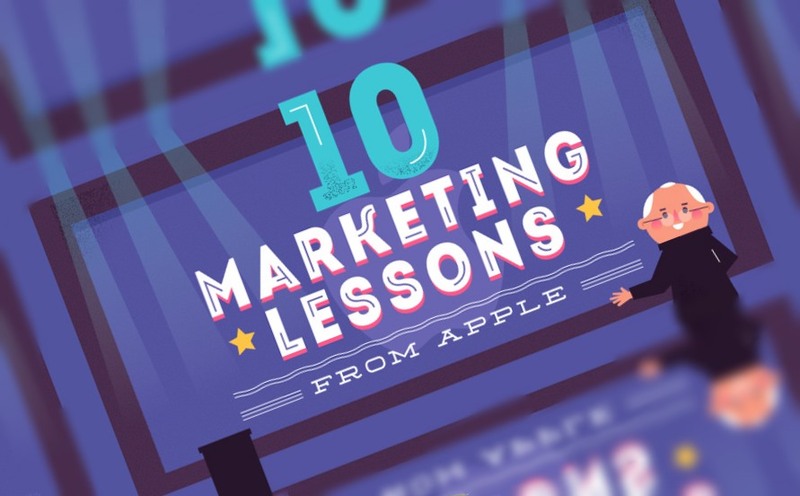 “If you want to be a lion, you have to learn from Lions” so today, we're sharing an infographic with you by the team at The Website Group containing 10 marketing lessons from Apple themselves! When you have a great product, not much else is needed because a great product sells itself. When it comes to marketing a product that you know will be high in demand keep the advertising simple and to the point. If you focus on the benefits (and differences) of your product then the rest will follow, there’s no need oversell! When speaking to your target demographic, leverage the message that is the quality of your product. People will pay more if they feel that it is well worth the investment and day by day customers are turning into more conscious buyers. Leave out the price and capitalise on the features. So you understand the concept of your marketing message and you've heard the phrase “content is king” thrown around a million times. So what is the next step? Pair your brand message with the most powerful form of content - visual content! Not everyone will take the time to stop and read your sales pitch, but if you engage them with quality and catchy visuals, you will have your target hooked. These are just a few of the tried and tested marketing strategies that have taken Apple from an idea one man had many years ago to a multi billion dollar company dominating the tech industry. If you too have an idea but all that's missing is the flawless execution of a winning marketing campaign, take a page out of Apple´s tablet, I mean book, to ensure the success of your launch!